A Mississippi treasure, the largest Greek Revival Antebellum home ever built in Mississippi. Located in Claiborne County, near Alcorn State University, 12 miles southwest of Port Gibson on Hwy 552 (Rodney Rd.) Built in 1859-61. The original owner, Smith Coffee Daniell II, born in Mississippi in 1826, the son of an Indian fighter turned farmer and a wealthy cotton farmer who owned over 20,000 acres of land (11 km²) in Louisiana and Mississippi. He married Catherine Freeland in 1849 amd had three children. He only lived in the large mansion for a few weeks before he died at 34 years old. The Windsor plantation once covered over 2,600 acres. It is said that from a roof observatory, Mark Twain used to stand and muse while overlooking the Mississippi River in the distance, and compared Windsor to a college instead of a residence, due to its size. Constructed by builder David Shroder In 1859 (Shroder also designed and built Rosswood, which is located in Lorman) the couple begin to build their home, Windsor, which was not completed until 1861. Slave labor was used for the basic construction of the home. The bricks used in the columns were made in a kiln across the road from the house. The columns were then covered with mortar and plaster. The fluted columns had iron Corinthian capitals and were joined at the galleries by ornamental balustrade. Note the iron carvings atop the columns and the iron centers. Skilled carpenters were brought from New England for the finished woodwork. 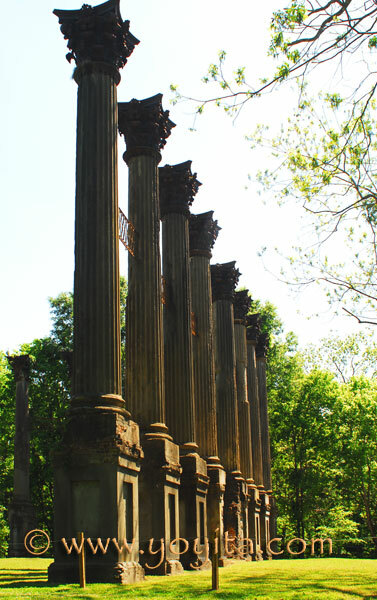 The iron stairs, column capitals and balustrades were manufactured in St. Louis and shipped down the Mississippi river to the Port of Bruinsburg, several miles west of Windsor. The four-story home contained 25 rooms and 25 fireplaces. The total cost of the mansion was $175,000 (app. $3,152,000 today). There were 29 forty-five (45) ft tall columns supporting the projecting roof line with it's plain, broad frieze and molded cornice. This provided protection for the galleries which encompassed the house at the second and third levels. Located 10 miles west of Port Gibson, Mississippi the Windsor home contained over 25 rooms, each with its own fireplace. On the Main floor, flanking the broad hall, were the master bedroom, a bath, 2 parlors, a study and the library. In the ell off this part of the structure was located the dining room. Directly below in the above ground basement was the kitchen, with the two connected by a dumbwaiter. Also in this basement were a school room, an on-site dairy, several storage rooms, a commissary and a doctor's office. They maintained their own commissary, doctor's office, school and dairy on the bottom floor of the mansion, along with the kitchen and storage areas. The second story floor plan reveals two parlors, library and, unusual to that period, a bedroom with a bathroom and study. Also, located on this floor was the dining room. Eight bedrooms and an additional bathroom were located on the top floor, water tanks in the attic provided water for the indoor baths. The front right corner bedroom was the birthplace for S. C. Daniell IV. The Windsor mansion is believed to have survived due to the southern charm and quick wit of the mansion's mistress and it's potential to the North as a Union Hospital and observation post. Windsor is also believed to be the first Mississippi mansion Grant's men encountered on April 30, 1863 shortly after crossing the Mississippi river from the Louisiana side on their way to cut off Vicksburg from the south. During the War Between the States, Windsor was used as an observation post by the Confederates, who sent signals from its cupola across the river to Louisiana. The house served as a Union hospital after the Battle of Port Gibson in May, 1863. Windsor was a host to many cultural events marking the romance of the era. When visiting the ruins you can almost hear the rustle of dresses and petticoats as the ladies danced with the gentlemen seemingly stylish with their silk ascots. On February 17, 1890, fire broke out in the house after a house guest accidentally dropped a cigarette in debris left by carpenters making repairs to the third floor. 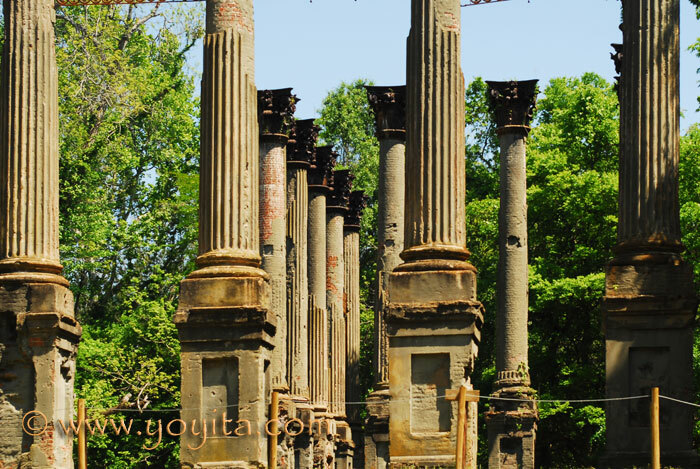 All was destroyed except a few pieces of china and 23 of the columns, balustrades and iron stairs. 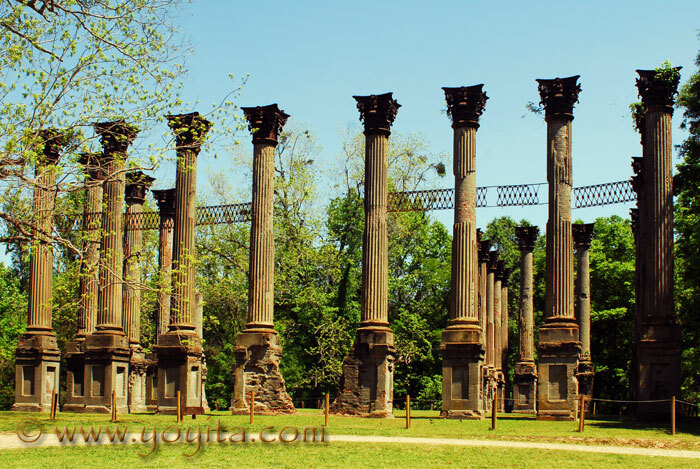 Windsor Ruins has appeared in several feature films, including Raintree County (1957), which included Elizabeth Taylor, Montgomery Cliff, Lee Marvin, Eva Marie Saint, and DeForest Kelley (Dr. McKoy, of Star Trek fame). 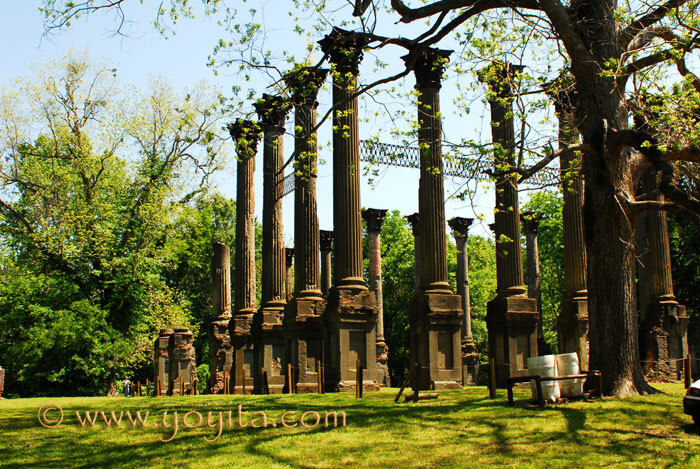 More recently, the columns appeared in the movie, Ghosts of Mississippi.